Next week, Parliament will vote on whether to accept Theresa May’s negotiated Brexit deal or – well, nobody really knows how that sentence ends. As part of the debate, the Government is supposed to have released the legal advice it was given regarding the deal – but it hasn’t. 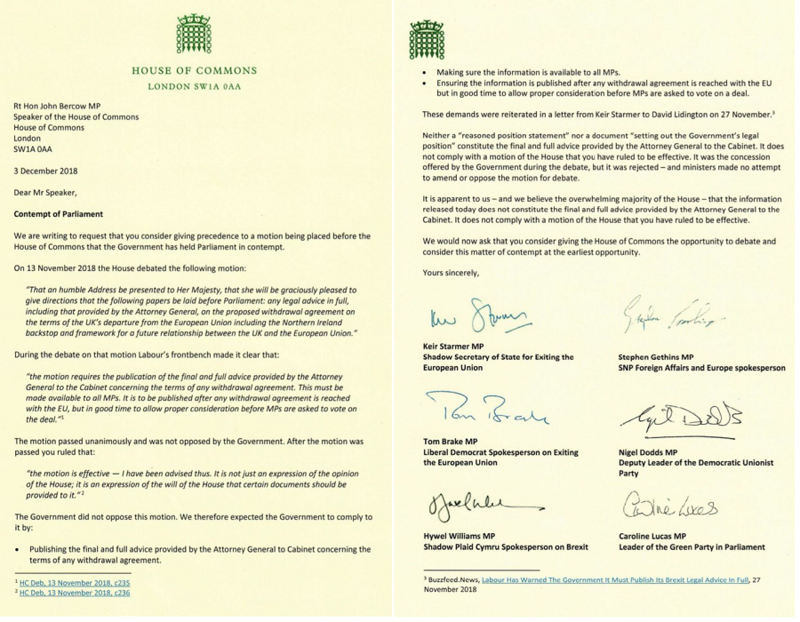 When they followed through on their threat, all six opposition parties joined together to write a letter to the Speaker to ask him to investigate whether the Government is in contempt of Parliament. The Government has failed to publish the Attorney General’s full and final legal advice on the Brexit deal, as was ordered by Parliament. These 12 comments express the general view extremely well. Brexit update: The DUP (who provide votes to prop up the government) have signed a letter holding the government in contempt for refusing to publish advice on the legality of the government’s Brexit deal. All we would like for Christmas is the glorious eventuality of Her Majesty's Attorney-General being held in Contempt of Parliament. We promise to be ever so good. It’s the year 2452. Kids chant “Remember, remember, the 3rd of December” as bonfires are lit to commemorate Theresa May’s plot to hold Parliament in contempt. The backstop is still in place. Contempt of Parliament can mean an MP being suspended or even expelled from the Chamber. Imagine if Theresa May was barred from the Commons. Is it considered crass to get the popcorn out as democracy crumbles?